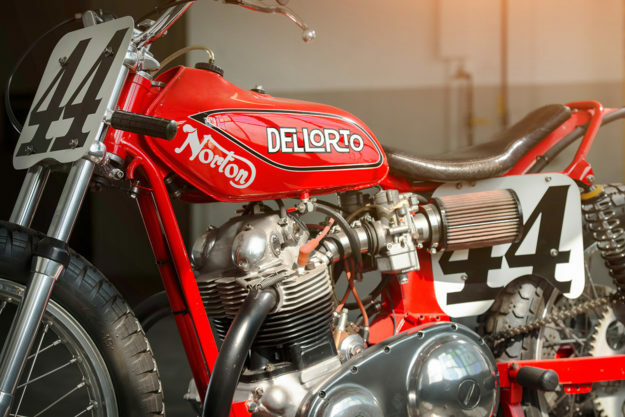 Discussion in 'Triton' started by steko, Jan 16, 2019.
does anyone have experience with two single Dellorto SSI carbs ? Never seen or heard mention of those carbs being used on a Triumph twin. had 32 Dellortto pumpers on it , way back when . Even came on B M W s at one stage . were hot sh*t aftermarket conversion in the 70s . Lack of throttle response is often due to loss of vacuum. I don't think a rapid richening of the mixture is the answer. The quickest acceleration occurs when the mixture is held at a level just before detonation occurs, at all throttle openings. It might be better to adjust to feeding the throttle on in one rapid controlled motion, rather than whacking it open. With road racers, riders of two strokes never have a problem with throttle response because they adjust to the limitations and anticipate. On dirt, things probably don't happen any quicker. Re; “With road racers, riders of two strokes never have a problem with throttle response because they adjust to the limitations and anticipate.”. . . . Oh yes they do, particularly if you have a massive pair of 38MM powerjets on a water cooled Yamaha TZ350-that’s 38mm per 175cc cylinder!!! a bigger carb than most car engines have! Some guys have trouble riding bikes which have 'peaky' motors. A four-stroke with a peaky motor can be worse than a two-stroke. Two-strokes usually have less torque when they get nasty. With the older two-strokes, the trouble usually occurs when guys slip the clutch to get them back on song. For anyone accustomed to doing point and squirt, older two-strokes can be very difficult. Later two strokes are designed to be more rideable, so they go faster. I don't know anything about motor cars, except that they are difficult to high-side.